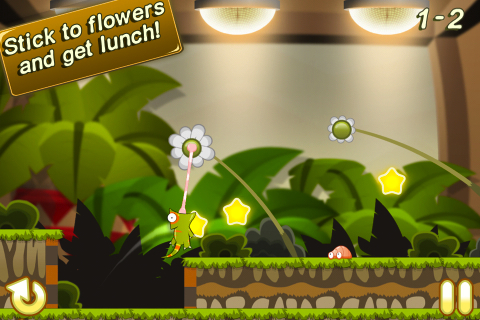 Munch Time is a game developed by Gamistry for the iPhone and iPod touch, that features Munch, an acrobatic chameleon on a journey to find food. His primary mode of transport is his tongue, which he uses to latch onto flowers and then swing. By swinging, Munch can clear obstacles and reach higher elevations. iPhone gamers will find Munch Time to have similarities with Chillingo’s Cut The Rope as far as its style and physics are concerned. Old-time gamers will find some aspects of this reminiscent to the Activision game Pitfall, but Munch Time is much more methodical than Pitfall was. In fact, Munch Time is as much, or ever more so, a puzzle as it is an arcade experience. The app has two environments, Terrarium and Mystic Lake, each with 20 levels, for a total of 40 unique levels. Along the way, the core goal is to find the “grub” on the level and eat it. As an added challenge, there are also Super Mario Bros like stars hovering on each level. In order to get the max score, you’ll have to hit those stars on the way to the grub, all within a certain time limit. One of the first things that distinguish Munch Time from the many similar iOS games is Munch himself. Some game characters have a personality that instantly draw you in as if you’ve known them for years. Mario has that. Sonic has it. Munch has it. Munch Time is brand new, but we’re sure many sequels are on the way (as with Cut the Rope), and we wouldn’t be at all surprised to see Munch graduate from the iPhone into a starring role in a platformer for the Xbox 360 and PlayStation 3. 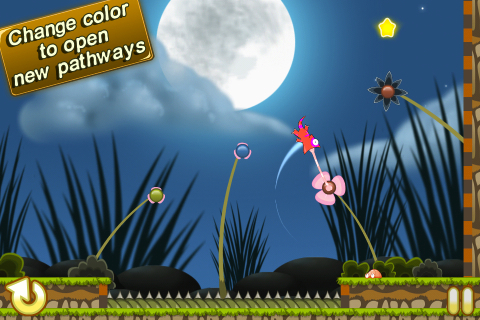 In the initial levels of Much Time, this application feels a lot like a platformer. The player will clear a few obstacles, reach a few elevations, and eat a few grubs. As you progress, however, the app morphs into something far more challenging. Getting from point A to point B becomes exciting enough, and you’ll have to figure out how to collect all those stars in the progress. During this review, there were several boards that I had to leave behind with imperfect scores, just to get through to the next level. The good news is you can always go back and try to outdo your previous rating. The Munch Time application has had a ton of work put into it, and a big part of that is the swipe controls. Latching onto flowers and other items can be difficult, especially when falling and required to re-latch. Had the controls not been precise, this could have been a nightmarish gaming experience. But the controls feel great, and you’ll be latching and re-latching intuitively. I don’t have to say too much about how amazingly polished and creative the graphics are int this game, as the screenshots speak for themselves. Let’s just say, Gamistry knows what they’re doing. If you’re a fan of of Angry Birds and Cut the Rope, Munch Time may be the next great iOS game you’ll fall in love with. There’s not a lot of long-term replay value, but with 40 levels for $0.99, your money is well spent here. It’s worth noting that this $0.99 version of Munch Time is not a universal app, although for $1.99 you can purchase a universal version called Much Time HD (iTunes Link) which works on both the iPhone and the iPad. And having tested Munch Time HD let me tell you it looks amazing on the New iPad and gameplay benefits a whole lot from the additional screen real estate. AppSafari review of Munch Time was written by Joe Seifi on March 18th, 2012 and categorized under App Store, Arcade, Featured, Games, Platformer, Puzzler. Page viewed 4021 times, 1 so far today. Need help on using these apps? Please read the Help Page.